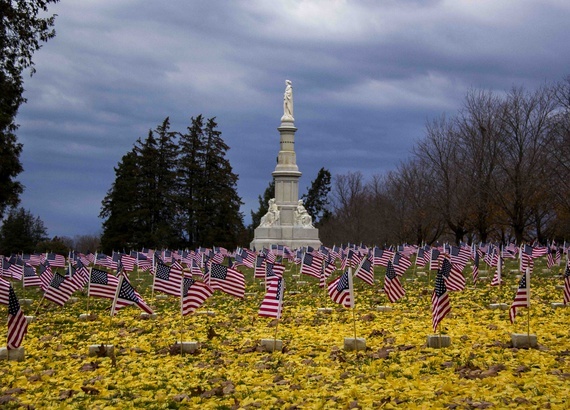 Olga Gazalie, a Friend of Gettysburg since 1994, provided in her will for an estate gift of $100,000 to benefit the Soldiers’ National Cemetery. A school teacher from Brownsville, Pennsylvania, Olga and her husband Albert made annual trips to Gettysburg National Military Park. A favorite spot for them was a stand of beech trees in the National Cemetery where they had their picture taken during every visit. After her passing in 2011, her estate provided $100,000 on behalf of her family to the Gettysburg Foundation for the benefit of the Cemetery. Caring for 100-year old trees that see hundreds of thousands of guests every year is a daunting task, and, thanks to Olga’s generous bequest, the National Park Service recently embarked on a multi-year project to assess and address the health of the trees in the Cemetery. The overall goal is to improve or maintain the health of the trees to ensure that they can be preserved for future generations. Work includes a comprehensive condition assessment of the trees throughout the Cemetery, trimming of damaged or problematic branches, the removal of select trees whose condition is deemed to be unsafe due to age and/or rot, and the installation of hidden cabling to protect against lightning and support the branches of the largest trees. The Gettysburg Foundation, the philanthropic arm of Gettysburg National Military Park, has administered many estate gifts to benefit Gettysburg National Military Park and Eisenhower National Historic Site. To speak with the Gettysburg Foundation about estate planning contact Beth Kirby, Vice President of Philanthropy, at 717-339-2102.